Hida Viloria | Quoted in People Magazine! Hida Viloria, chairperson of the Organisation Intersex International, notes that Keegan’s historic intersex birth certificate comes on the heels of another victory for the intersex community: in November, a judge ruled in favor of allowing OII’s associate director Dana Zzyym to be issued a passport despite not identifying as male or female. 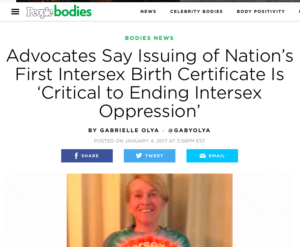 “Intersex people have suffered for centuries because of the notion that only males and females exist, which is why our associate director Dana Zzyym successfully fought for federal gender recognition as intersex on their passport last year,” Hida Viloria, chairperson of the Organisation Intersex International tells PEOPLE. Big thanks to People Magazine for their great coverage of this timely and important historic event! ← Fantastic Born Both Review by Kirkus!